First published in 1949 and praised in The New York Times Book Review as "a trenchant book, full of vigor and bite," A Sand County Almanac combines some of the finest nature writing since Thoreau with an outspoken and highly ethical regard for America's relationship to the land.Written with an unparalleled understanding of the ways of nature, the book includes a section on the monthly changes of the Wisconsin countryside; another part that gathers informal pieces written by Leopold over a forty-year period as he traveled through the woodlands of Wisconsin, Iowa, Arizona, Sonora, Oregon, Manitoba, and elsewhere; and a final section in which Leopold addresses the philosophical issues involved in wildlife conservation. As the forerunner of such important books as Annie Dillard's Pilgrim at Tinker Creek, Edward Abbey's Desert Solitaire, and Robert Finch's The Primal Place, this classic work remains as relevant today as it was forty years ago. 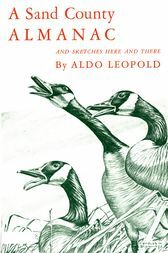 Aldo Leopold (1887-1948) began his professional career in 1909 when he joined the U.S. Forest Service. In 1924 he became Associate Director of the Forest Products Laboratory in Madison, Wisconsin, and in 1933 the University of Wisconsin created a chair of game management for him.